Grand Prairie hosted the 23,490 Evergreen Park Distance Challenge on Sunday. GRANDE PRAIRIE, AB—AUGUST 26, 2018—In his fifth start at the distance, Glittering Blue picked up his first win in an 870-yard race in the $23,490 Evergreen Park Distance Challenge on Sunday. Glittering Blue and jockey Blandford Stewart quickly took the lead and led the field to a victory of a length and a quarter in 45.750 to earn a 98 speed index. The 10-year-old gelding had 18 wins in 57 starts prior to Sunday’s Challenge race. He had finished second and had two thirds in his previous 870-yard attempts, though he also frequently competes at 770 yards and three furlongs. Glittering Blue ($8.00) has earned $92,287 to date in his extensive career. Over a third of his races have come in Grande Prairie, including his last start, a live race in which he finished fourth and each of the three horses in front of him returned to win their next start. Glittering Blue is trained by Alvin Cross Child for owner Cody Eagle Bear. He was bred in Alberta by Rigetti Farms, by Jess Louisiana Blue and out of Glitter Galore, by On a High. Er Café finished second in Sunday’s Challenge race in his first career 870-yard event. 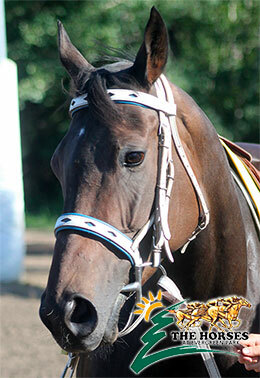 The son of Tres Seis was ridden by Dwight Lewis; Donalda Cochrane bred, owns and trains the 5-year-old horse. Er Café was bred in Alberta and is out of the Hawkinson mare Hawks Halo. He has two wins in his 21 career starts; he has placed in multiple stakes but is still seeking his first stakes victory. In 2017, he competed in the Evergreen Park Championship Challenge and qualified for several derbies in 2016, including the $33,000 Canada Cup Derby. Post-time favorite Kr Streakin Version encountered traffic early, checked, and recovered to finish third, a head behind Er Café but over three lengths ahead of the rest of the field. Kr Streakin Version, also a 10-year-old, has four wins in six previous attempts at 870 yards. He has two starts in 2018, hitting the board each time, after taking off all of 2017. In 2016, he won three of five and was never out of the money; he was won 12 of his 35 lifetime starts and earned over $90,000. J. B. Botello was aboard Kr Streakin Version, who is trained by John Poirier. The son of Latest Version is owned by Marvin Christensen and Richard Aldoff. He was bred in Montana by Hermstad/Perry/Kyler, out of Streakin Miss Tina by Streakin La Jolla. Completing the field were Lucky Royal Rabbit, Asbigastexas and Alpine Peaks. Bringit Like Benny was scratched.